The 200 page hard cover book is beautifully illustrated in color and contains a wealth of information on weddings, christenings, funerals, seasons and major feasts. A collaboration between SHSNEPA and the Michael Bosak Society of Prešov. So You Don't Read Slovak . . Well, you’re in good company. Today, the majority of Americans of Slovak ancestry have no practical speaking or reading knowledge of Slovak. What they do retain is an interest in their heritage and a curiosity about their roots. Help is finally here in the form of a book in the English language, Slovak Folk Customs and Traditions. The book is the product of a collaborative effort of the Slovak Heritage Society of NEPA with their “Sister Society”, the Michael Bosak Society of Prešov, Slovakia. Inspiration for the book came from reading several sources on Slovak Folk Culture in the Slovak language and realizing there was nothing published on the subject for English speaking readers. The wealth of material available made this kind of project both a blessing and a challenge. We asked our Sister Society to research the Slovak sources and then write the material around the idea of major life events, as well as the calendar and liturgical years. This was the challenge for the authors, Ing. Martin Bosak, Ph.D. and his brother, Ing. Rudolf Bosak. So much material had to be researched and sifted through before deciding what exactly the book should contain. The next step was to find translators who had a sensitivity to the material. Many emails were exchanged before the American editors could begin the task of putting the book into language understandable to an American English reader. Co-editors, Helen Savinski and Prof. Darina J. Tuhy, worked diligently to bring the translation into an easily readable form. Readers, there were four of them, then poured over each chapter and suggested refinements to the text. Anyone who has ever done this kind of work will know how time-consuming and painstaking it is. Next came the illustrations. One of the authors, Martin Bosak, had been busy attending a number of Folk Festivals and visiting various cultural sites. His camera was always at the ready at Vychodna, Kosice, Bardejov, Kracunovce, Svidnik, Medzilaborce, Orava, and Rajecka Lesna, to name a few. Ing. Alexander Tarca, a graphic artist, assembled the material and designed the layout. Finally, the book was ready for the printer in Prešov. Within three weeks the authors had the book in their hands. Well illustrated, the book contains a wealth of information on traditional Slovak celebrations: weddings, christenings, funerals and major feasts, including Christmas and Easter. The section on weddings contains the script for the ceremonies of “prepitanie”, the formal leave-taking of the bride and groom from their parents. The Christening section focuses on the role of the Godparents in bringing the infant to church for Baptism. The section on Weather Lore has translations of some of the most popular Slovak adages concerning sowing time and harvest time. In addition, the major feasts of the calendar year and the liturgical year are included in the contents. Getting the books to the U.S.A. was another daunting and expensive task. Martin Bosak hand carried 200 copies on his recent visit to the Heritage Society. His wife, Beata, accompanied him. Together they managed with meager personal belongings for their brief stay opting to use their luggage allowance for the weighty books instead. The entire project of getting “Slovak Folk Customs and Traditions” into the hands of American-Slovak readers who love their heritage and want to know more about it has been a labor of great love. We have dedicated it “to the memory of all Slovak mothers and fathers who instilled a love of God and of our ancestry deep into their children’s hearts”. May it prove to be a blessing to all who read it. Society presents Universities with Slovak Folk Customs and Traditions book. Copies of our book were presented to various local colleges, libraries, and universities. 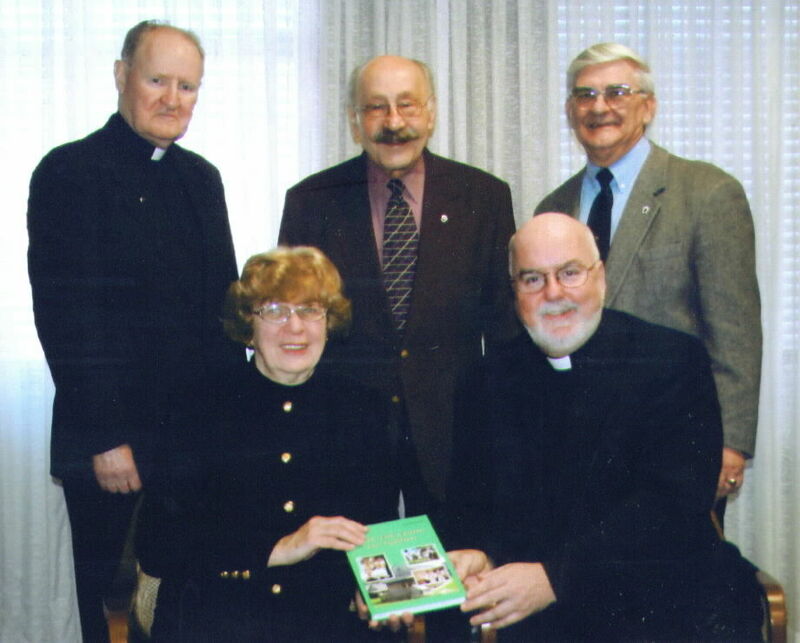 Below is the presentation to King's College, Wilkes-Barre, PA.
Rev. 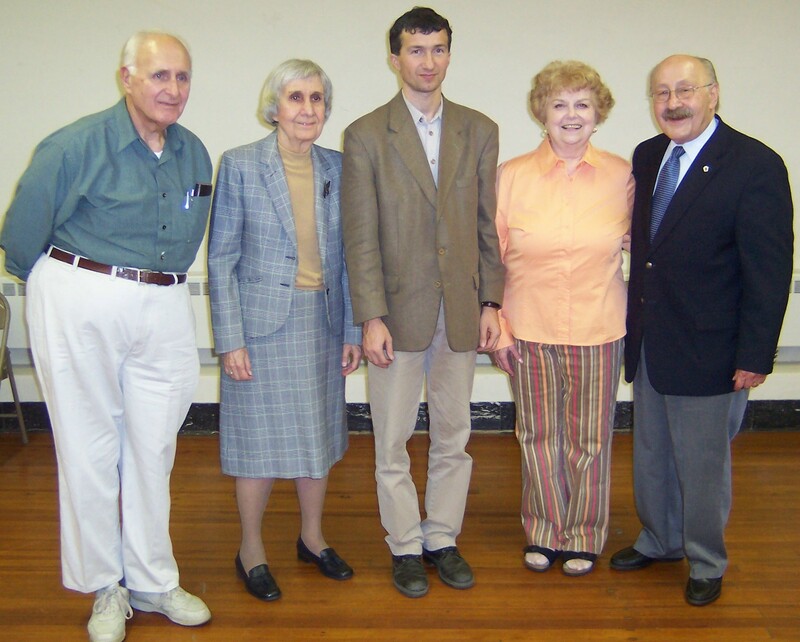 Patrick Sullivan, C.S.C., Ph.D; King's College; Philip Tuhy, SHSNEPA; William Zdancewicz, SHSNEPA; Magdalen Benish, SHSNEPA; and Rev. Thomas J. O'Hara, C.S.C., Ph.D., President of King's College. “Adrift in pleasant memory of youthful days, coupled with a warm glow of remembrance” describes the feeling one enjoys while reading “Slovak Folk Customs and Traditions” by Martin Bosak and Rudolf Bosak, published in Prešov, Slovak Republic, 2005. One tries to remember folk tales from our parents and relatives; however, in this publication, you find an “easy read” in presentation of customs followed for each of the four seasons… as well as for weddings, births and christenings, funerals and even weather lore (origin of names of parts of the year)… all of which was quite informative and fascinating. One quickly appreciates the time and effort put forth in the factual material researched and then presented in a clear and understanding way. A variety of original colorful photographs in Slovakia were included, adding authenticity to story lines accompanied. They too brought forth timely and wonderful memories of stories told by our parents and grandparents. A little over 200 pages make up this book… pages filled with a treasury of information for young and old to enjoy over and over again. One can easily recommend this book for family libraries and hopefully copies would be made available to libraries for public appreciation. Commendation of praise to the Slovak Heritage Society of Northeastern Pennsylvania and the Michael Bosak society, Prešov, Slovak Republic, publishers of “Slovak Folk Customs and Traditions”. We understand it is now in a second printing… congratulations and good luck in your endeavors of preservation and encouragement of Slovak Heritage.